Last year, I cast on the Oat Couture Prairie Blanket and got 12% into it before something more interesting grabbed my interest. Cascade 220 Superwash, because I'm a realist. I had wanted to knit one of these when I was 15 years old, but the first time I tried it, I wasn't as capable of reading the wrong side of my knitting or following a moving texture pattern, never mind doing both simultaneously. I've done a little more knitting since then. It's not for SharkBean. The red isn't speaking to me for SharkBean, beautiful as it is. Also, after watching Shark Week, it is vaguely reminiscent of chum. Not a bad thing, just an observation. I have someone in mind, but really, until she tells me that she's expecting, I'm not handing over this beauty. It's not the next "hardest thing I've ever knit", but I like it for lots of reasons. It's a brilliant variation of the classic dishcloth blanket, which I knit 7 million of in high school (for the NICU at the local county hospital, the same folks who get all of our Head to Toe hats). The dishcloth blanket, according to my Aunt Constance, is the ultimate in blankets-that-stay-on-babies. But dishcloth blankets are SO BORING TO KNIT. Miles and miles and miles of garter stitch, which is either (a) what hell is like or (b) penance for doing something horrible. It's the knitting equivalent of having to write lines. ("I will not say nasty things about acrylic yarn.") Over and over and over again until your hands fall off. 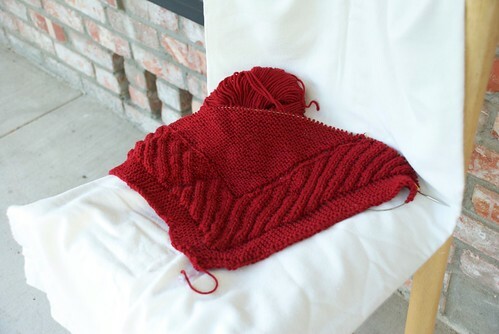 Somehow, the traveling rib on the second border (because there is a small garter border on the outside, THEN an eyelet, THEN the traveling garter rib!) makes knitting this a particularly potato-chippy knit. Also, it's a really sophisticated design, especially for something as utilitarian as a baby blanket. That is an absolutely beautiful color!! Love the pattern too! The blanket is lovely. Dishcloth style blankets are great for swaddling wiggly newborns and make them feel nice and cozy. I knit one for my little bean and it was worth every mile of garter stitch.